In this lesson, we will learn about the area of a rectangle. Learn about the formula to find the area of a rectangle. 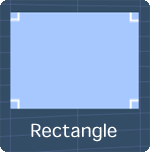 See an example on using the formula to calculate a rectangle's area. 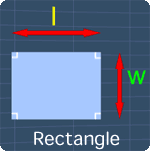 See another example on using the formula to calculate the width of a rectangle. A rectangle has four right angles. The sides of a rectangle that are opposite each other have the same length. Note that, the longer side of a rectangle is the length and the shorter side is the width. Also, a square is a special type of rectangle. The math video below will give more explanation on this. Also, we will see some examples on how to use this formula. Area of a Rectangle from MathExpression.com on Vimeo. Consider this rectangle with the length of L, and the width of W.
Now, we can get the area of the rectangle, by multiplying its length L with its width W.
With this, we get the area, A equals to, L multiply W. This gives LW. Note that, it is very important to include the unit. Since we are multiplying L with W, the unit for the area will be in the form of square unit. We will see more explanations on this in the upcoming example. Now, let's see some examples on using this formula. Find the area of this rectangle when its length is 4cm, and its width is 3cm. To solve this, we start with the formula for the area of a rectangle, A equals to LW. Since the length is given as 4cm, we can substitute L with 4. Similarly, since the width is given as 3cm, we can substitute w with 3. Next, we can simplify by multiplying 4 with 3. This gives 12. Now, this number is meaningless unless we include the unit for it. Since the length and width are given in centimeter, the unit for the area will be in square centimeter. Hence, the area of this rectangle is 12 square centimeter. Next example, given that the area of this rectangle is 20 square feet, and its length is 5ft. Find its width. Again, we start with the formula for the area of a rectangle, A equals to LW. Since the value of the area and the length is given, we can find the width, by solving this equation for w.
Here’s how. Since the area is given as 20 square feet, we can substitute A with 20. Similarly, since the length is given as 5ft, we can substitute l with 5. Now we have, 5w equals to 20. Let's rewrite this equation so that it will look neater. To find W, we need to remove 5. To do so, we divide both sides of the equation with 5. After doing so, we have, W equals to 20 over 5. 20 divide by 5 gives 4. Since the length is given in feet, the width of the rectangle will also be in feet. Therefore, the width of this rectangle is 4 ft.
You can start by going through the series of questions on the area of a rectangle or pick your choice of question below.